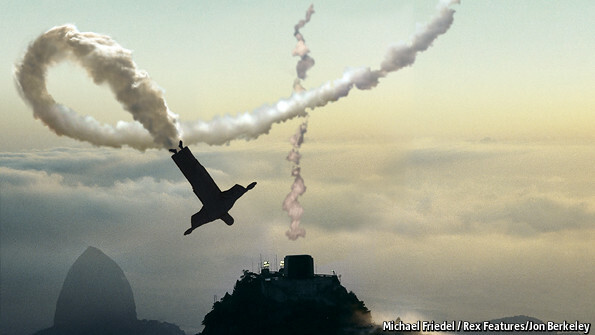 The Economist – Has Brazil Blown It? This entry was posted in Brazil and tagged Luiz Inácio Lula da Silva. Bookmark the permalink. 6 Responses to The Economist – Has Brazil Blown It? Brazil needs to access its strengths and weaknesses asp, fix things and get going… we a government with intelligence and quality investment. and… Janar, it’s good to have you back! Every economy goes through a self-correction, the amount of heat and deviations from the growth path of that correction is up to the government as well as, if possible, businesses. An economy is faith-based, much to the chagrin of some leaders. If the people do not have enough faith that things are going to improve, they are not about to make extravagant purchases. Would you? Even if some of the people are doing well while the economy is not, they are going to have one eye on that rear view mirror as they try to out drive what is approaching most. Countries that have faced a similar situation have opted for many different approaches — yet only ONE works… Ten years ago, Ireland was facing a huge problem with their economy and did what many politicians would think is suicide as it cuts off what they falsely believe is the only bloodline to the government – reduced taxes. ANY country that reduced taxes, as well as reduced the size of the government, ALWAYS fared well afterwards. Yet, the inability to test this again is believe to be political suicide by too many elected as well as appointed government officials. President Rousseff, during the G-20 conventions, quipped that it is difficult for Brasil to compete globally due to the tariffs imposed on imports… From what I understand, you could have heard a pin drop on a carpet with the following silence. Some did, politely, remind the President that those in glass houses shouldn’t be throwing stones (we all have had one of those OOPS moments). Brazil’s tax structure helped do what it was intended to do — how long can any government keep doing this is the question. No country has unlimited funds. Reducing taxes will put more money where it can be most effective — in the hands of the people. Until the people can see evidence that is contrary to what the economists, government, and news is saying, they will hold onto what they have without purchasing much of anything. Once they see that their savings and disposable income is increasing, there is a reflex to spend. I fear Brazil is snatching defeat from the jaws of victory, and yes I did mean it that way round. They were on a global roll and they seem to be blowing it, such a shame! I’m getting more Reals for my £ but inflation seems to be raising fast.